(Gloucester Township, NJ) – The Camden County Health Department has been notified by the state Department of Health and Human Services (DHHS) that a raccoon removed from a yard in Audubon has tested positive for rabies. On Oct. 30, an Audubon resident reported that two dogs had been attacked in their yard by a raccoon, and that the owner of the dogs was scratched by the raccoon when trying to interrupt the fight. After the encounter the Audubon Animal Control Officer was notified and the animal was picked up and submitted for testing. 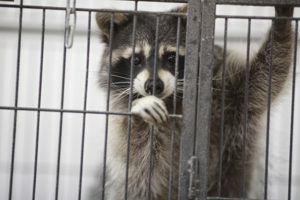 The animal was tested for rabies at the state Public Health & Environmental Laboratories in Trenton (PHEL). There were no other human exposures, or any other animal exposures observed. On Nov. 2, The Camden County Health Department was notified by the DHSS that the animal tested positive for rabies. The homeowner is cooperating with the DHSS on the treatment and observation of their dogs. The owner is also receiving treatment for the scratch obtained during the incident. The NJDHHS has not provided the name or address of the individual that reported the incident. Rodriguez said interested residents can learn more about rabies through the internet by accessing the information available from the Centers for Disease Control and Prevention at www.cdc.gov/ncidod/dvrd/rabies/or, residents may call the Camden County Department of Health and Human Services at 856-374-6370.